The power went out tonight for a few hours because of an electrical fire down the street. I only managed to get the packing list posted late tonight but if you stop by tomorrow afternoon I should have the outfit options finished and uploaded to this post as well. I really need to start getting my posts done ahead of time to be prepared for unexpected situations like this. *Edited to add that the outfit options are now finished and uploaded to the post below. Many years ago, and by many I think it was around 2007 or so, I bought a bootleg version of Rosetta Stone to learn Dutch. I obviously didn’t learn Dutch because I would have totally bragged about that fact on here 😉 I can’t speak it (although I can read some and understand kids story books) but it was a really fun language to study, and I wish I would have stuck with it. Instead I decided that French was a more practical choice since it is the foreign language we learn in school here. The bootleg didn’t work on my newer computer so I gave up on it and moved on to focus on the french. This post is motivating me to start up again though. I was pretty obsessed with Amsterdam and at that time if you asked what my dream home was it would have been a canal apartment. 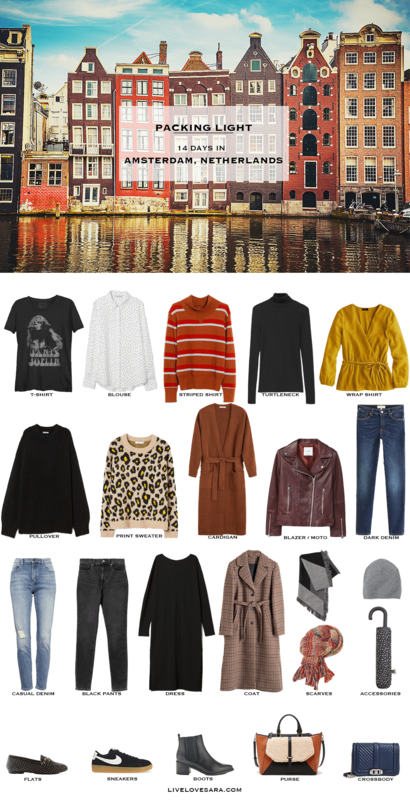 So after I read a request for a late fall Amsterdam packing list, and saw that they were staying in a canal house for 14 days I couldn’t turn it down. I’d love to stay in a canal house in Amsterdam and bike around the city. It would be well worth the effort of making Merle give up her training wheels and teach her how to ride a two-wheeler (she is very resistant on this and refuses to even try). In late fall/autumn and early winter it can rain a lot so the booties I included are waterproof (and comfortable according to the reviews), and I also included an umbrella. Umbrellas can be found and purchased in many places for cheap so you can easily pick up an inexpensive one there when you arrive if you want to save to room in your suitcase. The autumn colours that the trees are starting to turn inspired my choices today and I hope you like them as much as I do. I totally agree with you there. Most of my blog demographics come from the U.S. and the UK so when I get requests 99% of the time it’s for a major European city or for a cruise. I’ll definitely keep this in mind though when I am going through suggestions. Thanks! Just discovered your blog and Pinterest page. Obsessed!!! I am visiting Prague the first week of November and have been combing the internet for inspiration! Do you think the black H&M dress with the long cardigan and sneakers would work there for a day time look, as well? I would definitely wear that. Maybe with shiny black leggings or some black tights if it’s cool out. Have a great time!